Your baby is continuing to put on extra weight during the 35th week of your pregnancy, and he may drop lower in your abdomen in preparation for delivery day. This dropping can cause some additional urinary urgency for you, but there are strategies to help. By the 35th week of your pregnancy, your baby is measuring more than 18 inches long from the top of his head to those cute little toes. He is weighing an average of 5.25 pounds. According to the Mayo Clinic, your little one will be packing on the pounds during this week and the rest of your pregnancy. Expect your baby to gain about half a pound each week. Gaining this extra fat layer beneath his skin will do more than give your little one that adorable chubby appearance; it will also help your baby regulate his body temperature after birth. This is also a time when the vernix caseosa, that protective waxy substance that covers your little one's skin, will increase in thickness. The American Pregnancy Association reports that you may be able to feel your uterus approximately 6 inches above your belly button by the 35th week of your pregnancy. Your weight gain is probably between 24 and 29 pounds. However, there are many ways in which you can carry this excess weight. Depending upon your own size and the position of your baby, you may be carrying higher, lower, bigger, smaller, wider, or more compactly than your pregnant friends. Your baby may drop lower in your abdomen around this point in your pregnancy or in the coming weeks. Called "lightening," this is part of your body's preparation for birth. Although this dropping frees up more room in your upper abdomen and chest, allowing you to take deeper breaths for the first time in a few weeks, it also places more pressure on your lower abdomen and bladder. This can lead to urinary frequency and sometimes incontinence. Avoid drinking anything in the hours before bedtime and use the bathroom just before getting into bed. This will help avoid waking up to use the bathroom. Practice Kegal exercises to strengthen the pelvic floor muscles. Contract the same muscles you would use to stop your flow of urine. Locate the nearest bathroom when you're away from home. That way, if you need to get there quickly, you won't waste time trying to find it. Use the bathroom frequently, even if you don't have to go. This will prevent your bladder from becoming full. If you notice that you are leaking fluid, remember to confirm that it is urine and not amniotic fluid. Call your doctor if you are unsure or if you suspect you're leaking amniotic fluid. Although you may be planning a vaginal birth, it's important to know that cesarean births are often necessary for babies to make their way safely into the world. Understanding the conditions that might prompt a c-section and the effects of this procedure can help relieve some of your anxiety. This is a good point in your pregnancy to research this type of birth. In the event of fetal distress, a prolapsed umbilical cord, a ruptured uterus, or other complications, a cesarean is often the best choice for a safe delivery. Many doctors also perform cesareans if the mother suffers from kidney disease, a respiratory disorder, or another condition that would make a vaginal birth difficult. However, many experts are concerned about the recent rise in cesarean births. According to childbirthconnection.org, in the United States, about 33% of babies are born via cesarean. While a large portion of these cesareans were medically necessary, others were performed largely for convenience or to protect against possible malpractice lawsuits. Since a cesarean is major abdominal surgery, most women will require a three to four day hospital stay and have a longer recovery time for a vaginal birth. It's also important to note that 50% of infants born via c-section have a low Apgar scores at birth. This score is used to measure an infant's mental and physical condition at the time he is born. Your doctor or midwife is your best resource for finding out about cesarean birth. Your healthcare provider can inform you about all the risks and benefits, as well as your own chances for requiring this type of procedure. 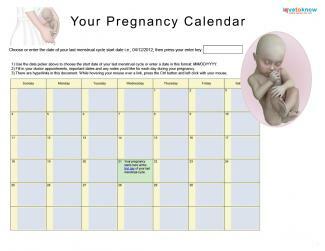 If you need help downloading the pregnancy calculator, check out these helpful tips. After this week, you will have about one month until you get to meet your little one. Your prenatal visits will become more frequent in the coming weeks as delivery day approaches.